This 30-Minute Loaded Taco Skillet is loaded with veggies, lean protein, and so much flavor! All you need is 30 minutes and one skillet to prepare this low carb, healthy meal that everybody will devour! This skillet is flavorful and veggie packed. It’s perfect for a weeknight meal or to make and package up in containers for lunches! This month my blogging ladies and I are showing you recipes to make using only ONE SKILLET. Yes, that’s right! Easy, light on the clean up, and delicious. 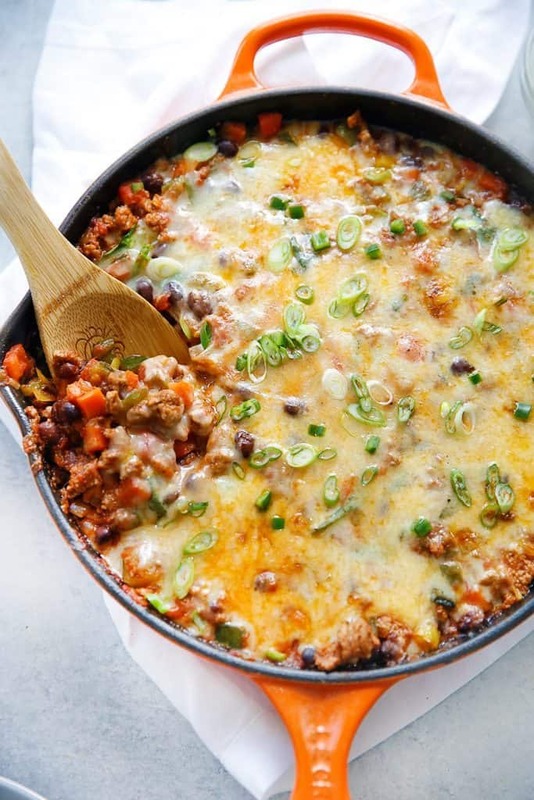 This one-pot chicken Mexican rice casserole uses sweet potato for extra creaminess! It’s a healthy, gluten free, 8 ingredient dinner for busy weeknights that is only 330 calories. Dinner is done in less than 20 minutes with this quick and easy zucchini noodle lo mein. It’s loaded with shrimp and veggies for a low-carb protein packed meal that’s perfect for busy weeknights. Paleo and gluten-free. with vegetables makes for an easy one pan meal! Healthy, Balanced, Paleo and ready 45 minutes. Feed your family with this Flavorful Mediterranean pork dish in a tangy balsamic sauce. In a skillet over medium heat, heat oil and add in garlic. Add in zucchini, peppers, carrots, and onion and let cook for 3-5 minutes, until veggies begin to soften. Add in turkey and coat with chili powder, paprika, garlic, salt, and pepper. Cook until turkey is brown and no pink remains. Add in tomatoes, green chiles, and black beans and mix to combine. Reduce heat to a simmer for 5 minutes. Add in spinach and mix until wilted. Taste and adjust seasoning as desired. 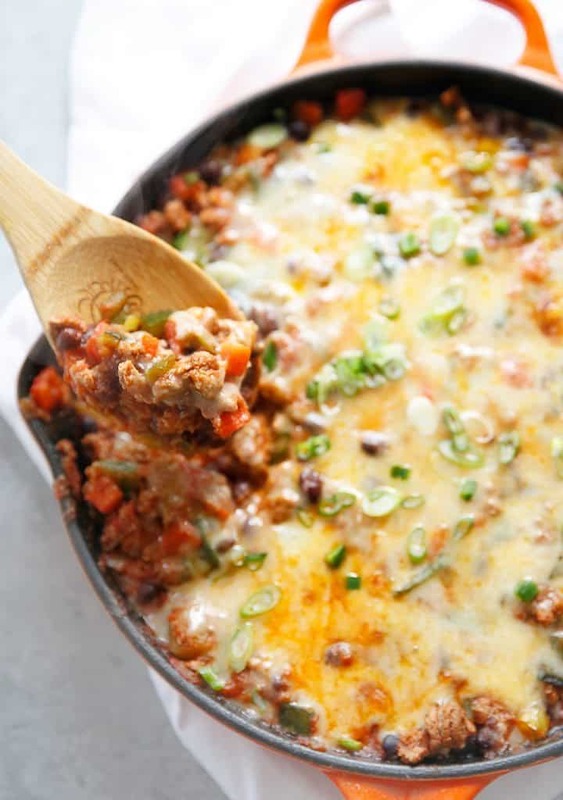 If adding cheddar cheese, sprinkle over the top and cover the skillet until cheese melts. Serve hot with chopped scallions over rice, cauliflower rice, or with tortilla chips! That CHEESE though! Taco anything is always a winner, and I can’t wait to try this! where’s my fork? I need to dig in. Taco HEAVEN! This looks amazing, Lex!! So ready for Taco Tuesday! It’s up now — sorry!! Seriously obsessed with this. Taco all the things! So, I made this loaded taco skillet for my family over the weekend. It’s so good!!! I have a hard time getting my kids to eat veggies but when the veggies are cut up small and added into a dish with meat and all the taco flavor–they went right for it! The only thing I did that was different from the recipe is use a pound of grass fed ground beef rather than turkey. I didn’t have turkey on hand is the only reason. I did add all the cheese and avocado. Yummy dish. I’ll be making it again. LOVE this recipe! I can’t believe how simple it is to make. I made this for my family and they absolutely loved it! I love the one pan meal, especially when it’s taco themed. Thanks for the easy recipe! Thanks, Kevin! Hope you love it! This recipe is SO good! My husband and I have made it twice already. Fast, so healthy, and delicious- what more could you want! Thank you! This was amazing! I added a few diced sweet potatoes to the recipe as well. Thank you for this super easy recipe! This is amazing!! I found your blog through PaleOMG and Juli’s podcast with you. I cannot wait to try more and can’t believe I’ve never thought to make something so simple as this. Beautiful blog–looking forward to going through your 30 min or less recipes and your weekly meal plan posts. Do you have a nutritional break down on Carbs/Fat/Pro and Calories? On your recipes? Just asking since I’m following a ketogenic lifestyle. If not no problem, I can figure it out. Very nice website..Great job! Yes, always. Drained and rinsed well. What is the serving size and calorie count? Definitely making it! Looks so yummy. Can I use 1 teaspoon garlic powder instead of the granules? Serving size will depend on how hungry, but for us it usually serves 4! Can I use 1 teaspoon garlic powder instead of the granules? So wish calorie count was included on this recipe! Working on adding them 🙂 It’s fairly low cal, though. How big of a skillet do you use? I have a 12″ cast iron, would that be good for 1 lb of meat? I kind of want to make it with 2 lbs of meat (since that’s what I have defrosted). I have a bigger oven safe skillet, but it’s not cast iron. You *may* need to use bigger. It doesn’t have to be cast iron! YUM! 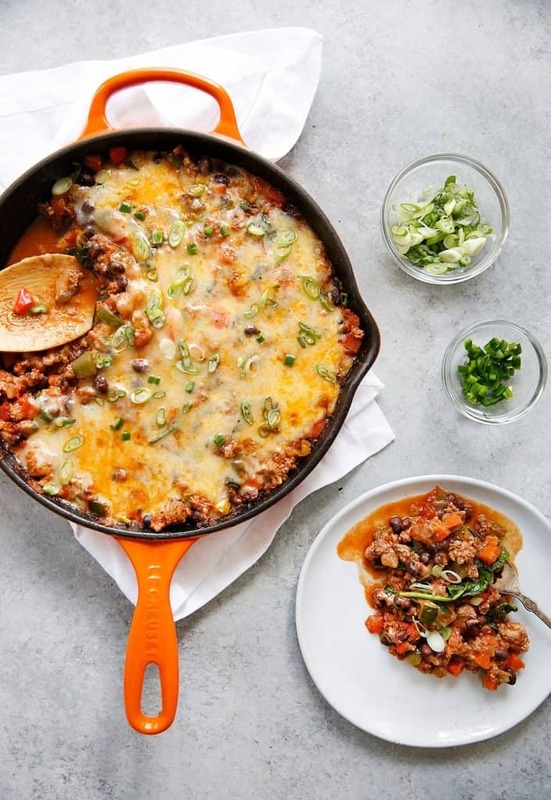 I love one skillet meals especially when they are loaded with veggies. Perfect weeknight meal! This was amazing! My whole family loved it- even my picky eater! Delicious!!! We honestly have not had a recipe from Lexi that was less than that though!! 😉 I have a kid who does not/will not eat bell peppers or zucchini and he ate everything in here ( I confessed later and he wasn’t thrilled but still said he would eat it again…hallelujah!) Texture, taste, seasonings and everything were on point. My husband and youngest had it with tortilla chips and my oldest and I had a few plantain chips with ours for a bit of crunch. Everyone thought it would be great in burrito as well. Another recipe in the rotation at our house. My favorite recipe hands down. I make this at least once a week – so easy and quick and perfect for lunch leftovers! I leave out the onion and garlic and it still has lots of great flavor. This was delicious! I used ground chicken and kicked up the spices. Absolutely full of flavor and filling!